Yes, whilst Absolutely Fabulous, The Liver Birds and Miranda will all sneak in, they're mostly in the minority. And, sure, many of the other sitcoms will feature strong, female characters, but they're almost always shackled to a male lead with an equal share in power. Now, the reasons why there's such an imbalance in the genders - when it comes to celebrated sitcoms - is far too deep and complex to be tackled on a humble blog post, so I won't be attempting that. Neither shall I be writing about Absolutely Fabulous, The Liver Birds and Miranda as they've all been covered within an inch of their lives a thousand times before. Instead, I'll be sticking to the Curious British Telly ethos of highlighting the lesser known gems; in this case, female led sitcoms that perhaps you caught an episode or two of, but can't quite remember the name of. And, whilst some of these are rightfully forgotten, there are many more which still demand a bit of recognition. Threads was a 1984 BBC2 drama/documentary which tried to predict what would happen to Britain if nuclear war broke out and follows the path taken by Ruth Kemp and her family. It's a show which is regularly feted as one of the most bleak, disturbing and realistic pieces of drama to ever air not just on British TV, but in the history of the entire planet's televisual output. 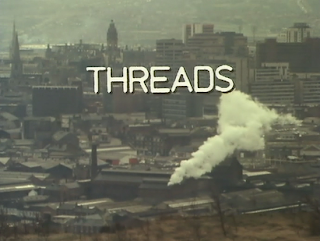 And, no matter how many times I watch it, the unflinching honesty of Threads leaves me feeling incredibly disconsolate, but completely engrossed. It's a rare TV show that can tap into all our fears with such brutal realism, but it's rarer that a narrative has such a searing emotional intensity that it removes us from the confines of comfortable viewing due its proximity to our worst fears. And that's why I decided it was time to detail what I considered the 15 most horrifying moments from Threads in order to re-iterate the show's position as a disturbing, but masterful exercise in emotional TV. Gary Lineker is, quite frankly, a national treasure extraordinaire. Coupling slick presenting skills with a brilliantly measured dose of wry humour, he's helped to infuse Match of the Day with an affable charm for nearly two decades. And then there's his adverts for Walkers Crisps which knowingly skewered his Mr Nice Guy persona with a nasty crunch. The foundation of his national treasure status, of course, emanates from his glorious career as a striker with a penchant for lurking in the six-yard box and soaring up the scoring charts wherever he went. And if it wasn't for Bobby Charlton, Wayne Rooney and Graham "let's sub him" Taylor, Lineker would easily be England's leading goalscorer. And what's even more remarkable about Lineker is that he shimmied neatly away from the pitfall of becoming an English player going abroad and failing to make their mark. In fact, during his spell at Barcelona in the 1980s he was even dubbed The King of Spain. 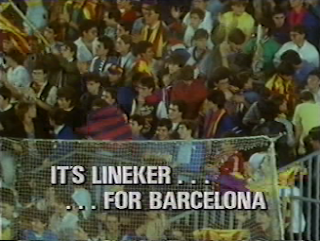 Whilst Lineker wasn't adorned with ermine robes, his first year at Barcelona was akin to a coronation as observed in It's Lineker For Barcelona.